There are over 100 fishable miles of small streams located within an hour or closer of Park City. Some of our favorites small streams include Currant Creek, West Fork of the Duchesne, Strawberry Pinnacles and Diamond Fork just to name a few. These rivers are loaded with wild Cutthroat trout, Rainbows, Brookies, Browns and the occasional Grayling. The average fish in these small streams average between 10 to 16 inches with an opportunity of catching a fish in the 20-inch class. These rivers are dry fly and dry dropper exclusive, there is just no need to put on an indicator. Many of these small Utah rivers are often over looked by the average fisherman and guide services. If you are looking for solitude and incredible dry fly fishing then you don’t want to miss out on this trip. Due to the duration of the drive and the remote areas, all small stream adventures are full day trips only. We also offer a unique opportunity for more advanced fly fisherman who like to test their skills for a shot at a trophy-sized trout on less publicized rivers. These are the places our guides don’t talk about in public and where you might see them on their days off. These trips are better suited for smaller groups and are only offered as full-day trips. If you are interested, please inquire about our secret streams. I’ve been fishing with Jeff for the last ten years. He is the only guide I will fish with in Utah. Jeff knows where to go and just as important when to go to any particular river. 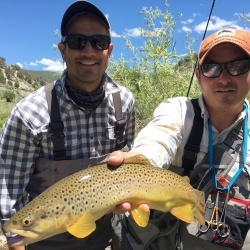 He is as good with beginners as he is with experts but if your time is precious, Jeff knows where the fish are and will ensure that you have the fly fishing experience you hoped for by finding fish in the local gems and remote Utah waters.